I think most places using IE6, or even IE5, are also places which are very locked down, and most usually can only access their own system. This means it’s not incredibly important to develop according to IE5, and sometimes IE6, but it also means their market share is technically higher than what we see. As I used a locked-down computer, though, I once again realized that I just couldn’t handle it. Quite simple, I will not work for a company where I can’t run my own programs. I visited my old highschool, today, and they had so many restrictions that it was hard just to copy an image from my flash drive to one of the computers. Frankly, I’m surprised the flashdrive was able to install itself. The library was further restrictive, and wouldn’t allow me to view source. View source! It’s like my bread, and they took it from me, as well as the wine of my freedom. I was starving, on those machines. While I was at the school, I talked to a teacher there who teaches students about business plans and stuff like that, in the hopes that he might be able to refer some start-ups to me. He pointed me to Modern Earth Web Design, which is a Winnipeg business about ten years old that the school has worked with for a while. Something like that. Apparently, Winnipeg is becoming a hotspot for web developers. Who would have guessed? Modern Earth is apparently the largest web design company in Manitoba, but I had done some searches for web designers in Winnipeg and they had never come up. Luck of the draw, I suppose. So, I’m going to have to do some contacting, and put myself out there. I’ve got my heart set on freelancing, really, but maybe I could get some recommendations or a few pointers. I could always freelance while working somewhere. That would go wonderfully on a t-shirt. I think I’m going to get it done. I originally saw it in a comment on someone’s blog, a month ago. I tried looking for it, but I can’t remember where I saw it. I’ll have to think up some other funny t-shirt designs, and then start a little online store. Oh, wow, the developer tool in IE8 is actually pretty impressive. Back when I had IE7, I did a quick look into who had the better source viewer, because that can be rather important. I think firefox had some line numbers and syntax highlights, but otherwise wasn’t anything special. I completey forget Safari and Opera, but I think they had either text or something similar to firefox. 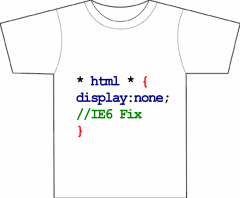 IE6 and IE7 both had a Notepad window come up with plain text inside, and chrome had a pop-up window full of element attributes that would highlight parts of your webpage as you hovered over the different elements in the code. Needless to say, Chrome took the cake, and ate it, too. The other browsers were mad at it, but I guess they should have gotten pie, instead. The new IE8 Developer Tool lets you change between IE6, IE7, and IE8 rendering modes in two clicks, sends your code off to the W3C validation tool, resizes the window, creates rulers, view the document with a collapsible tree view and highlighted syntax, and more. Most importantly: not only can you see every element and attribute in both HTML and CSS, but you can disable CSS or disable individual styles. And burst into laughter? I swear, I laugh every time I see it. At least three prototypes were unveiled for Android at the Mobile World Congress on 12 February 2008. One prototype at the ARM booth displayed several basic Google applications. A ‘d-pad’ controls zooming of items in the dock with a relatively quick response. A prototype at the Google IO conference on May 28, 2008 had a 528 MHz Qualcomm processor and a Synaptics capacitive touchscreen and used the UMTS cellular standard. It had a 128 MB of RAM and 256 MB of flash. I’m sure you know where I got the quote from. But take a look at those numbers: 528MHz? 128MB RAM? That’s as good as or better than computers ten years ago. I think the screens are getting to be VGA, now, too. So there you go. I’d love to take one of those things back in time and casually pull it out as geeks are gushing about their latest-and-greatest 400MHz processors. Oh, and another thing? Chrome has beaten out Opera in market share, and it’s only a few months old.